A glucose meter (or glucometer) is a medical device for determining the approximate concentration of glucose in the blood. Many diabetic patients find it challenging to insure that all the proper supplies are accounted for, to receive accurate results in his/her glucose level. This Owell Blood Glucose Starter Meter kit provides all the appropriate supplies that are required to test your sugar level. This OWell Easy Touch Diabetes Kit includes a Diabetic glucose meter with 100 test strips, a box of OWell 30 gauge twist off sterile lancets; 100 count, a surgical lancing device, a carry case, & batteries for the meter. This Diabetes meter is perfect for a starting or senior diabetic patient with its easy and simple glucose monitor and lifetime warranty. CLIA Certified this meter with its recognized accuracy. This Easy Touch Meter provide multiple extensive options. 1. This glucose monitoring systems results will save up to 300 tests, and provide 4 alarm reminders of when to test yourself with a 12/24 hour settings. 2. There is no coding that is required to type into the meter, all you do is place the test strips into the diabetic testing meter and watch it turn on. Apply minimal amount of blood to the sample test strip, wait five seconds for the results that appear in large clear font. 3. Capability for alternative site testing’s including palms, forearms, and fingers. 4. All the easy touch supplies are fresh with long lasting expiration dates. All the products in this kit is required, and, or will make it easier to receive the most accurate blood sugar results. With these meter options you can properly keep track of your sugar level from previous readings easily and efficiently. Warning: Contains small and sharp parts. Keep out of reach of small children and pets. 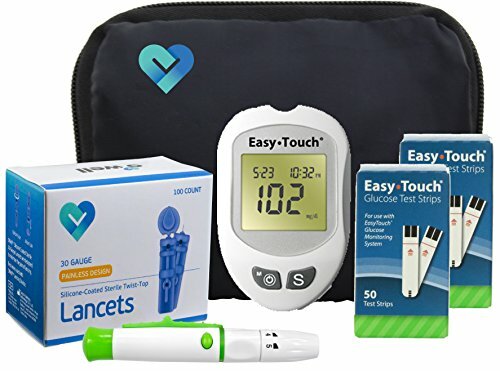 VALUE STARTER KIT: Includes; Easy Touch Blood Glucose Meter, 100 Easy Touch Test Strips, 100 Lancets, Easy Touch Lancing Device, Manuals, Log Book & Carry Case (Control Solution Sold separately). If you have any questions about this product by OWell, contact us by completing and submitting the form below. If you are looking for a specif part number, please include it with your message.